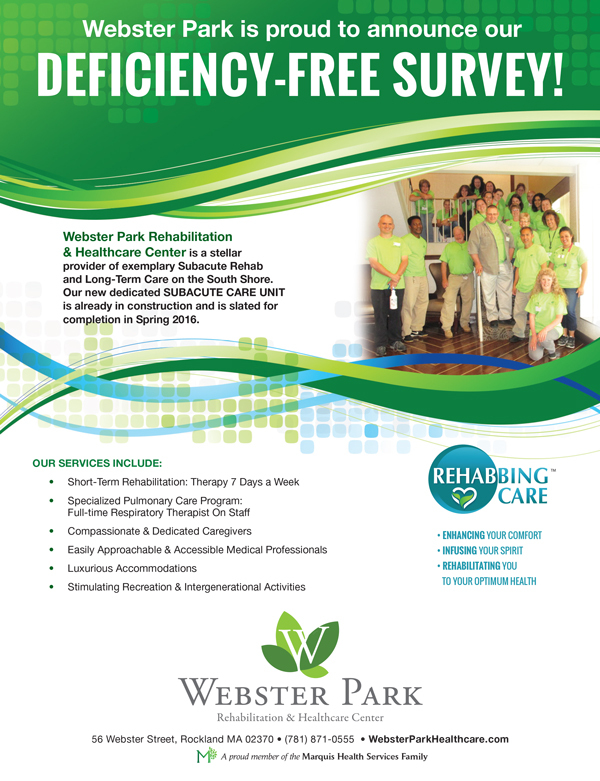 Webster Park Rehabilitation & Healthcare Center, a proud member of the Marquis Health Services family, renowned for their distinctive Rehabbing Care™ recently consolidated its reputation for excellence, achieving Deficiency-Free results in the annual survey conducted by the Massachusetts Department of Public Health. This rigorous survey examines various aspects of quality, safety and overall performance and is conducted via unannounced annual visits to healthcare facilities with the purpose of evaluating compliance with State and Federal regulations. “The results of this Survey range from medication management, proper skin care, food service, environmental safety, and respect for patients’ rights and dignity” indicates Kathleen Ferranti, administrator at Webster Park, “and truly reflect the superior quality of care we provide, and our dedicated teamwork that helps each patient achieve maximum functionality in the shortest amount of time so they can return home and resume their cherished daily routines. Serving the South Shore Area with distinction for more than four decades, Webster Park prides itself in the many staff members who have been part of the Center for a decade or more, forming a close-knit team of familiar caregivers who get to know their patients on a personal level, and are attuned to their every need. Led by a stellar medical staff that includes specialized physicians affiliated with top local and Boston area hospitals, and a formidable team of dedicated RNs, LPNs, Webster Park delivers advanced rehabilitative treatment following stroke, heart attack, traumatic injury, and pulmonary medical conditions. In the subacute unit, their expert team of physical, occupational, and speech therapists provide aggressive personalized therapy regimens administered up to 7 days a week, 365 days a year under the auspices of a renowned orthopedic surgeon and their staff physiatrist – a board certified rehabilitation physician. Being “Deficiency Free”, it turns out, is not only the result of their most recent survey at Webster Park, but their overall flawless environment that encourages the patients to make a swift return home. ← A Successful Groundbreaking Ceremony Filled With Excitement at Webster Park!